The Individuals with Disabilities Education Act (IDEA) governs how states and public agencies provide early intervention, special education, and related services to children with disabilities. To understand it thoroughly, school psychologists, teachers, and other school service providers need a comprehensive resource to guide them in what this frequently amended Act means and how it should be interpreted. The first concise, yet authoritative, book of its kind on which professionals can rely to navigate this often–misunderstood law, Essentials of IDEA for Assessment Professionals is that source. Like all the volumes in the Essentials of Psychological Assessment series, each chapter features numerous callout boxes highlighting key concepts, bulleted points, and extensive illustrative material, as well as test questions that help you gauge and reinforce your grasp of the information covered. Written in the user–friendly and well–known Essentials format, each of the seven concise chapters covers terminology, classification, assessments/evaluations, and other topics related to IDEA. 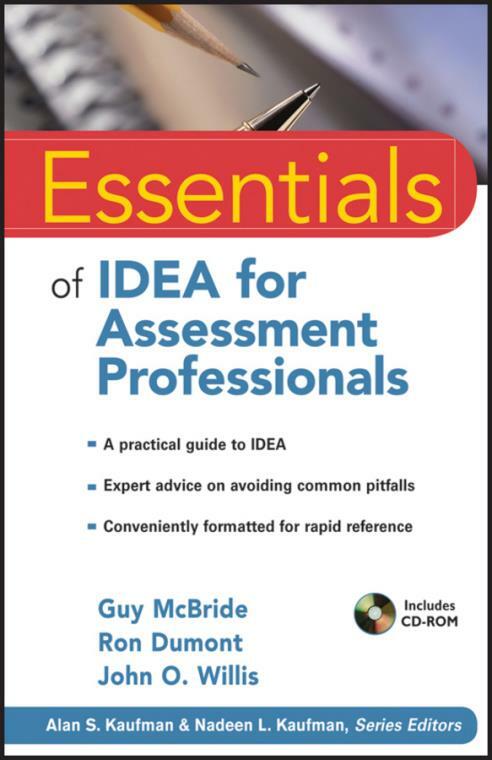 With an accompanying CD offering commentary on judicial decisions related to interpretation of IDEA, as well as references to the 2006 final regulations for IDEA 2004 and Section 504 regulations, Essentials of IDEA for Assessment Professionals provides helpful guidelines for educational assessments and evaluations.